You probably chose law enforcement as a career because you wanted to help people. But where can you go when you need help? COP 2 COP is a new, free and confidential 24-hour telephone HelpLine. It is available exclusively for law enforcement officers and their families to help deal with personal or job related stress and behavioral healthcare issues. It can be a crisis. It can be just a simple question. It doesn’t matter. COP 2 COP is here for you. You can call just to talk over your concerns and issues. You’ll speak with someone thoroughly trained to handle problems unique to law enforcement. It could also be a retired law enforcement officer who is now a clinical professional. Or perhaps it will be a retired officer working as a Peer Supporter. From a Peer Supporter, you’ll get honest, straightforward support and customized service from someone who has lived the life, who has served and understands the rigors and pressures you face everyday. When the job gets to you, it’s great to be able to blow off steam with a fellow officer. Most times, that’s all it takes. But when the issues run deeper, COP 2 COP is ready to help you and your family cope with and resolve your problems. Besides Peer Support, COP 2 COP offers Clinical Assessments, Referrals to The Police Clinical Network Providers and Critical Incident Stress Management Services. Here to serve those who protect and serve. COP 2 COP is a well designed, professionally managed step-by-step telephone HelpLine available to all of New Jersey’s law enforcement officers and their families. Offices are located in all major regions of the state. The toll free number can be called 24 hours a day. The service is free and confidential. Available 24 hours a day, 7 days a week. You can speak with a retired law enforcement officer. Someone, in many ways, just like you. Some are full-time staff. Others are volunteers. They listen. They talk. They understand. This also is done over the phone. You’ll speak with an experienced professional counselor, often a retired law enforcement officer trained specifically to help other law enforcement officers. If your problem requires additional treatment and follow-up, you’ll be directed to a vast network of professional resources throughout the state. Referral: If it is decided additional treatment is needed, you will be referred to one of our Police Clinical Network Providers. They have been trained to treat the unique needs of officers and their families. This is a de-briefing service and assessment for those involved in highly critical, stressful and traumatic incidents. The de-briefing methods used follow the International Guidelines established by the ICISF. 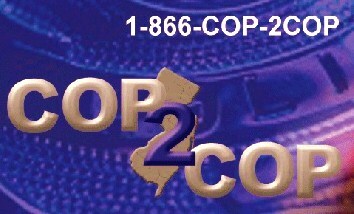 COP 2 COP maintains its own de-briefing teams plus has access to similar teams throughout NewJersey. The COP 2 COP HelpLine is not solely for emergencies either. If you just have a question. If you’re looking for legal or financial help or to discuss family-related issues. Don’t hesitate to call. Program Director: Cherie Castellano, MA, CSW, LPC.